The ANCHOR IN is now hosting live jazz, blues, Latin, and pop every Fri. and Sat. night from 6:00 until 9:00 p.m. The club and restaurant is located at 3122 West Lake Road, in Erie. The entrance is at the rear of the Oasis Pub. Free parking. No cover. No smoking. Great food. Erie bassist Stephen Trohoske returns to the Anchor In as Frank Singer's special guest this Friday from 6-9pm. Steve is a well-known bassist here in Erie, performing and organizing many music events throughout the area and making his mark on the regional music scene. 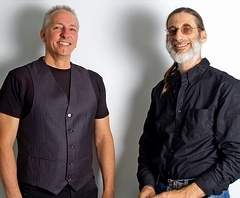 Steve and Frank have performed together for many years in and around the Erie area. The duo will perform Jazz and Latin standards as well as some Hard-Bop and Original music from Steve. Stephen Trohoske was born into a family who loved music, and grew up to the sounds of many different styles, evolving into a deep love and devotion to Jazz, World, Dub, Reggae, Avant Jazz, Black Rock, Funk, ECM, Brit Blues, Punk & Post Punk. Much of this music included melodic bass lines, walking lines, riffs, dub bass & deep ostenatos that would become part of Stephen's trademark sound. Stephen's bands have included Art Groupies, Hands Of Thieves, Is What It Is, Ahimsa Beat, 3bop, Aziz and SoulClap. He has toured with The Foley Project, worked with dance companies, and composed a piece for a Toronto-based dance company in 2005. Stephen has performed and recorded or shared the stage with such artists as Ernest Dawkins, Poet Monica Igras, G.Calvin Weston, Kelvyn Bell, Dwayne Dolphin, Dave Shiavone, Christian Howes, Corey Wilkes, Lou Stelutte, Eddie Baccus Jr., Greg Bandy, Chris Hemmingway, Tony Grey, David "Fuze" Fiuczynski, Robbie "SuperSax" Edwards, Foley, Cecil Ruckers, Dr. Nathan Davis, Rodger Humphries, Blood Ulmer, Claire Daly, Chelsea Baratz, Marcus Belgrave, Uhmar Raheem, Cheryl Hodge, DJ Logic, Willie Waldman, John Shannon's Wings of Sound and Todd Clouser's Love Electric. 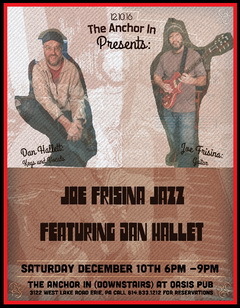 Joe Frisina Jazz was started by Meadville Guitarist, Joe Frisina, to showcase Jazz Music from all genres featuring various Jazz artists from around the region. Joe Frisina Jazz has been featured at Julian's Bar and Grille, The Mariner Seafood and Steakhouse, The Gardner Theater, The Italian Civic Club of Meadville and The Anchor In showcasing artists such as Frank Singer (guitar), Dave Callaghan (saxophone), Mikel Prester (saxophone) and this week: Dan Hallett (keys and vocals). Along with Joe Frisina Jazz, Joe plays in Guitar Madness with Frank Singer and Jim Lynch, Joe also plays bass with Frank in his original Jazz Fusion Band, Cats A Bear who have been featured in the Erie Reader, Celebrate Erie and the 2013 Erie Art Museum Jazz Festival at Frontier park. Joe Plays guitar for the Dave Callaghan Quartet and Meadville Rock Cover Band, The Happy Hours. Joe also plays with Frank Singer on bass in his original Rock Band Too Big Power. Joe is featured on his original Too Big Power recording 'Ride A Wave' (2005) and Cats A Bear's new album due out soon and countless live performances. Joe owns and operates Too Big Studios in Meadville and is featured on many of his clients recordings. Jazz Pianist and Vocalist Dan Hallett also hails from Meadville. 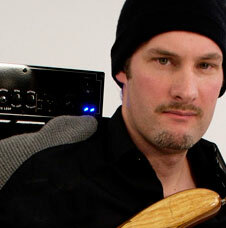 Dan is best known for his work with his jazz fusion band The Armitan Hand and The Soul Crackers. Dan also played with Erie's Chicago Tribute Band 25 and 6 two 4. Dan is an integral part of the Jazz scene and Meadville and has hosted the Cootie Harris Jazz Jam for many years and up until recently the Bosco's Jazz Jam in Meadville. 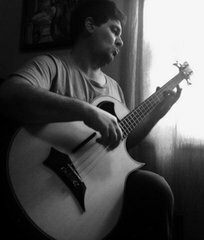 Dan is an avid supporter of music all over the region and is regularly called to sit in on gigs by many artists who know him for his tasteful harmony and rhythmic comping and imaginative soloing. Electric bassist Sean Dimico is a hidden treasure on the Erie regional jazz scene. His sophisticated harmonic awareness, swing, and melodic, musical solo lines have made him a key member of the Soul Crackers and Armitan Hand groups, and an enriching player in the informal sessions listed above. Sean's long association with Hallett, as well as with Frisina, gives them an ease and confidence together which serves their music well..
Tony Grey (born March 23, 1975) is a multi-instrumentalist, composer, master bassist and record producer, born in Newcastle England based in New York. He is known for his 6 string electric bass technique and his blend of jazz world fusion compositions. Tony was raised in a family where music was just another family member. His path toward becoming a musician was born out of an accident that nearly took his life. At the age of 18 when Tony laid with a broken back he first picked up a bass guitar. During his recovery he started playing under the watchful eye of legendary guitarist John McLaughlin. Tony graduated from Berklee Collegel of Music in Boston in 2001 with the prestigious “Outstanding Performer” Award. Since graduating, Tony has led many clinics and master classes at Berklee and has appeared in many of the college’s showcase events including a tribute concert to US pop legends Steely Dan hosted by the president of Berklee and attended by Donald Fagen and Walter Becker of Steely Dan. Tony has gone on to collaborate and perform with some of the world’s greatest musicians, such as: John Mclaughlin, Hiromi, Herbie Hancock, Wayne Shorter, Gavin DeGraw, Hotei Tomoyasu, Dennis Chambers, Zakier Hussain, Gregorie Maret, Gary Husband, Mino Cinelu, Brian Blade, Mike Stern, Wayne Krantz, Steve Lukather (Toto) Branford Marsalis, Toby Lightman, Simon Philips (Toto), Dave Holland, Kenwood Dennard (Sting, Miles Davis), Russell Ferante (The Yellow Jackets), David Fiuczynski (Screaming Headless Torsos, Meshell Ndegeocello), Larry Watson, Fabrizio Sotti, Ada Rovatti, Jetro Da Silva (Whitney Houston, Patti Austin), David Garfield, Frank Mccomb, David Nichtern, Gene Lake (David Sanborn), Dave Dicenso, Chris Dave, Oliver Rockberger, Falguni, Deantoni Parks, Lionel Loueke (Wayne Shorter, Charlie Haden), Christian Scott. In 2008 he released his second album “Chasing Shadows” under the Abstract Logix label. His latest production “Unknown Angles” under the ObliqSound Label (released in 2010) is a work of expansive emotional range, great personal significance and stunning virtuosity, “Unknown Angels” is the most fully realized statement yet from an artist who may have started late but has certainly made up for lost time. David VanAmburg began his music career playing the coffee house circuit, and as a multi-instrumentalist with various bands, including Calico. During a brief (40-year) timeout to raise his family, build businesses, and start JazzErie and other organizations, he played with Marty O'Connor & Friends and 57 Pickup. He now returns to his love of playing music. Vocalist, harmonica player and drummer Joe Dorris is in his fourth decade of professional music performance, singing and playing drums in "The Dorris Brothers" from the time he was 16. After gaining more experience in "Whiskey River" and other groups, Joe migrated from Erie, PA to Boston, MA to study advanced drumming with Gary Chaffee, author of the "Patterns" drum workbooks. It was here that he met guitarist Frank Singer and co-founded the 30+ year enterprise "Cat's A Bear", a group that performs original Jazz and Funk. Joe sang and played in the Boston area for many years in a multitude of styles and genres including World-Beat "Ibrahema". 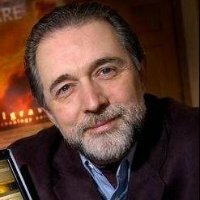 He also used his unique, low-register voice to do voice-over for radio and television, and singing for various professional projects including The Editors, Billy Walsh, Willy Eger, Tony James, Sharon DiFranzo and Jake and Jean. Joe shows his long background with and love of the Blues in his harmonica playing, adapting the Blues Harp to Jazz as well as Blues. Recent JD Jazz CD releases include harmonica as well as the foundation of guitar and voice that is JD Jazz and Blues. The new CD includes an original Blues by JD called "Seen It Comin'", a cathartic tale of loss. Frank Singer's study of Jazz Guitar began in 1976 at Berklee College of Music in Boston, MA. After attending post-graduation studies with private instructor Charlie Banacos until 1982 Frank began playing Solo Jazz Guitar in the Boston area. 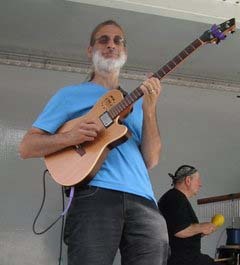 Frank spent many years developing his playing ability and knowledge of the Jazz repertoire as a soloist and in combos ranging from duos and trios to big bands, including guest appearances with artists such as Larry Coryell, Richie Cole, Greg Abate, Claire Daly, Arturo Sandoval, Dwight Adams, Pete Mills, Tony Monaco and many others. He performs regularly with Jazz Duos at the Anchor In, as well as teaching Jazz lessons locally and online.